I should start reading past blog entries whenever I’m feeling unproductive. It turns out that I did a lot more than I thought in 2010 – and had a lot of fun doing so. Ashlee versus the Donut Burger: Think I exaggerated about the peril of eating a cheeseburger between two Krispy Kreme donuts? Scarf one down and tell me how you feel 30 minutes later. 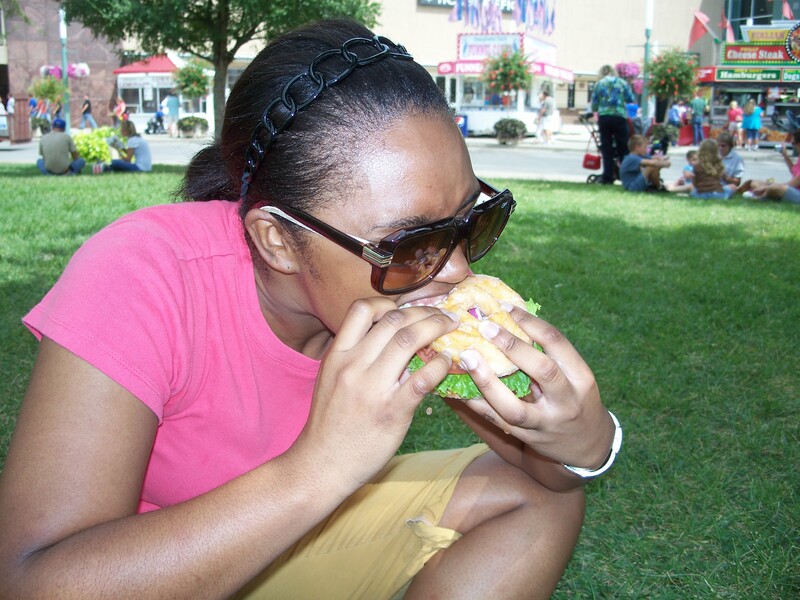 I could have really used some Tums that day when I ate this monster burger at the Kentucky State Fair. Chicken Fest and KFC, y’all: A couple of friends and I visited Laurel County, Kentucky, birthplace of Kentucky Fried Chicken and home of the annual World Chicken Festival. The highlight of the trip was meeting a handful of Colonel Sanders lookalikes. I’ve never seen so many white suits and moustaches in one place. The chicken wasn’t what I expected, but you can’t beat eating a KFC two-piece meal in the place where it all started. Adventures at Aldi: I love Aldi. Every visit is filled with glee when I look at how many reuseable bags I fill for half the price of other stores. Let’s face it, I might name my first child after this grocery chain. It’s not local, but the prices are right for someone on a tight budget. My four tips for shopping at Aldi remains one of the most-read posts on Ashlee Eats. Some dude named Emeril: Celebrity chef, author and television host Emeril Lagasse stopped by Louisville for the first-ever Fork, Cork and Style event at Churchill Downs. He had some really nice things to say about the city, and it made my heart squeal with pride.